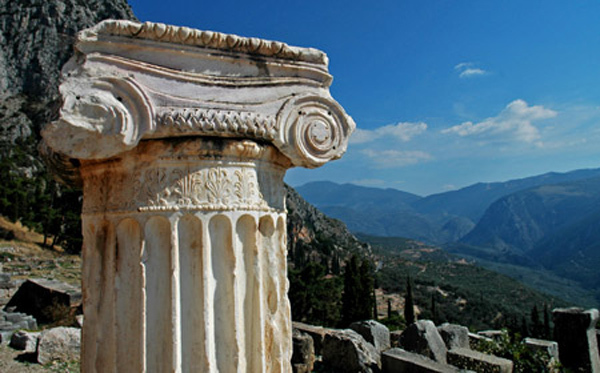 Prices for customized True Greece trips start at $350 per person per day (not including your international airfare). Welcome to Greece! Upon arrival at the Athens airport, you will be met by your True Greece transfer representative, who will assist you with transportation to your first night's Athens luxury hotel. 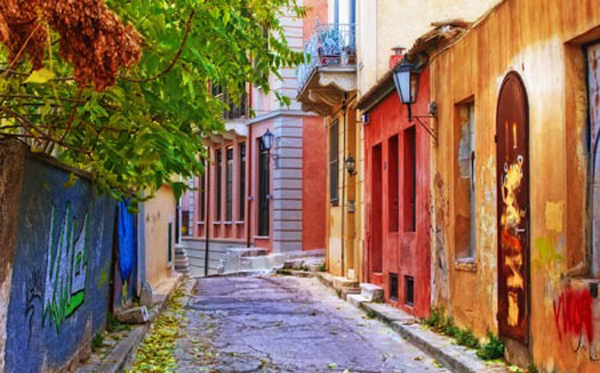 Once you have settled, take advantage of our travel recommendations and head out to explore Athens' exciting neighborhoods such as Plaka, Monastiraki, or Kolonaki. 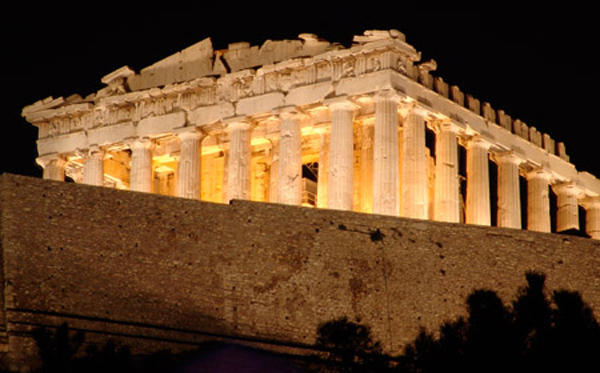 During your first exploration, you're sure to get a glimpse of the beauty of the most famous Greek landmark, the Parthenon. 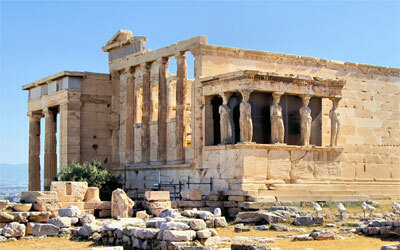 You'll have the opportunity to explore this ancient monument during your second stay in Athens. If you have not included a guided tour of the New Acropolis Museum as part of your Athens Highlights tour, then this would be a perfect opportunity to discover this incredible museum. Be sure to enjoy your first Greek cuisine experience at one of our True Greece recommended Athens restaurants or traditional tavernas. Today you'll travel to Mykonos! After a short flight or ferry from Athens, arrive and settle in at one of the island's authentic luxury boutique hotels, or perhaps a luxurious beach resort. 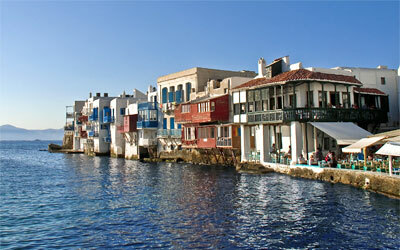 Mykonos is rich in history and culture, offering a vacation package with much to see and plenty to learn. You can head off to the main Mykonos Town and stroll through the picturesque white-washed lanes, or visit the famous windmills and churches. Enjoy a gourmet dinner at one of True Greece's recommended Mykonos restaurants and then head out and experience the island's rich nightlife. In the morning, as part of your vacation package, join your local True Greece guide on an educational and unforgettable daytrip to nearby Delos Island, where you'll visit ancient ruins of the 7th century BC, and learn about the area's history from a local guide. Delos, mythological birthplace of Apollo and a sacred and commercial center of Ancient Greece, is one of the most important archaeological sites in Greece. The afternoon is yours to hit one of Mykonos' spectacular sandy beaches or continue to explore the island. Today is open to you to enjoy in a variety of unique and memorable ways! Enhance your travel package with a visit to the Mykonos archaeological, folklore, or maritime museums. Snack at a lively seaside cafe. 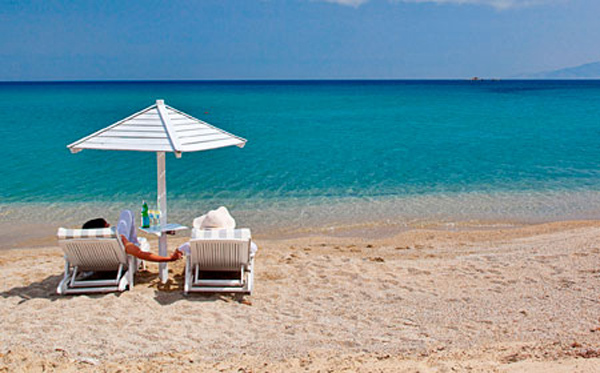 Swim or simply relax at yet another of the remarkable beaches of Mykonos. 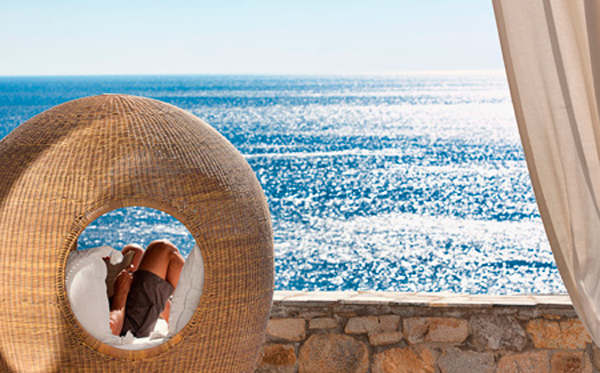 By now, Mykonos has become comfortably familiar, but there's still plenty more to experience. Return for a farewell visit to the Mykonos Town, visit "Little Venice", and shop at the island's bustling market, featuring a collection of stores, ranging from souvenir shops to designer boutiques and luxury jewelry shops. Indulge in one more great night out - return to your favorite restaurant, bar or club, or venture out to try something new! It will be hard to say goodbye to Mykonos, but you're off to Santorini, perhaps the premier travel destination in the Aegean and a perfect location for your honeymoon. A short 2.5 hour ferry ride will bring you to a land of dramatic red and black sand beaches, whitewashed houses and cobblestone alleyways. After checking-in to your boutique hotel nestled into the cliffs, you'll feel inspired by the landscape and compelled to do a little exploring on that first day, so head out and investigate Santorini's local shops and restaurants. We suggest visiting the traditional Oia settlement, and topping off your day with a dinner in one of the wonderful Oia tavernas. 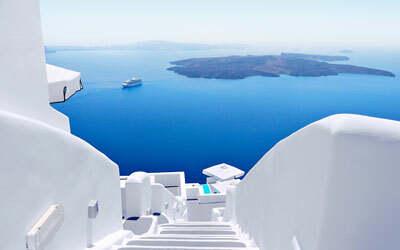 Santorini's unique volcanic origins have created a magnificent natural structure, and what better way to appreciate a work of art located in the Aegean Sea than with a sailing trip arranged by True Greece as part of your luxury vacation. You will sail from the south side of Santorini going past the White and Red beaches, the Venetian lighthouse and into the crater where you can visit the Hot Springs. You will then sail to a secluded bay for swimming and snorkeling in the crystal clear waters. After a satisfying day of sight seeing and swimming, indulge in a delicious seafood and steak barbeque served with a variety of appetizers and salads. Santorini is renowned for its dramatic volcanic cliffs and picturesque sunsets, but there's far more to this island jewel for you to enjoy! A favorite of many is a daytrip to the island of Thirasia, a treasure nearly untouched by civilization where time seems to stands still. If relaxation and pampering is what you need, a trip to a local spa or a visit to the Perissa or Kamari beaches offer a leisurely day of sun and rejuvenation. To finish your day, choose a local bar to enjoy an early evening drink and take in the magnificent Santorini sunset. If you're still itching for more, take a trip down the 800 broad, zigzagged steps from Fira to the port below. This is an experience you'll definitely remember, particularly if you take the traditional donkey ride on the way back up (a cable-car is also available)! Cozy Ammoudi beach awaits you below Oia with family-run tavernas that serve an excellent seaside lunch. For your last night on Santorini, we recommend a traditional Santorini taverna with local cuisine and delicious local wines. Welcome to Crete! Check-in to your boutique hotel in one of Crete's coastal towns of Rethymnon, Chania, and Heraklion or perhaps we've arranged accommodation at an exquisite luxury resort located in one of the world's premier resort and travel destinations, Elounda. Enjoy the rest of your day at leisure with a walk through one of picturesque harbors, cool off at the beach, or indulge in a relaxing spa treatment. Depending on your location on the island, today you may begin with a True Greece guided visit to the palace of Knossos, one of the four main palaces of the ancient Minoan civilization still present in Crete. After learning about the Minoans' active religious life and their introduction of a written script known as Linear B that was an early form of Greek, you can top off your rich cultural experience with a fine Greek meal. You will then return to your hotel in the late afternoon for some additional leisure time. If your hotel is located in Elounda or Heraklion, then a trip to the Lasithi Plateau is always highly recommended as part of your True Greece vacation package. The Lasithi Plateau is an impressive and mystical location with rich vegetation and hundreds of windmills, situated among sharp peaks and mountains. In fact the nature is so dominating that according to tradition the mighty Zeus was born in a cave here, called Ideon Andron. If you choose to visit the cave you will learn a great deal about Greek mythology's central role in the ancient Greek civilization. 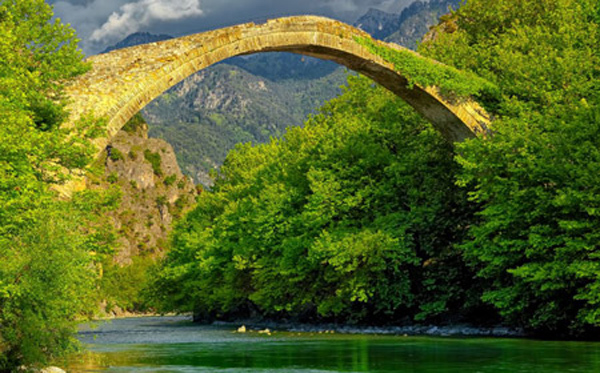 If your hotel is located in Rethymno or Chania then you may like to consider hiking the Samaria Gorge. Although this hike is quite strenuous and perhaps not for everyone, if you enjoy outdoor adventure then walking through the gorge you will experience nature in the wild: see geological formations, botanical specimens, and if you are lucky you may even see high up on the cliffs the rare wild species of Cretan mountain goat, the Kri-Kri. Once you make out the "Iron Gates" you will be on the final and most beautiful stretch of your trek. 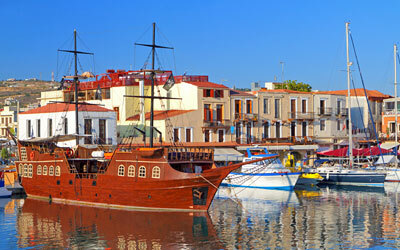 Reach the harbor of Agia Roumeli, and take the ferry boat to Sfakia, where your TrueGreece driver will be waiting for you. Take a well deserved rest during your drive back to your hotel and reminisce on the amazing sights that you saw. No matter the location of your hotel and whatever you choose to do on your final day on Crete, we are sure that you will have enjoyed the incredible ambiance of this historical island. Board a short flight back to Athens, where you'll enjoy the last memorable day of your True Greece luxury vacation package. In the afternoon, take a tour of Athens and its most significant sights together with your local True Greece guide. 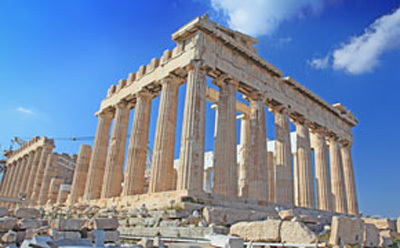 Of course, no vacation package to Athens is complete without a climb to the Acropolis ("peak of the city"), where Ancient Athenians of the 5th century BC erected the great temple dedicated to the goddess Athena - the extraordinary Parthenon. You will also see the Ancient Agora, as well as some of the finest structures of modern Athens, such as the Kalimarmaro Stadium, home of the first modern Olympics in 1896, and the old Royal Palace and today's Parliament, with the elite unit known as the Evzones guarding the Monument of the Unknown Soldier. Finally, celebrate the end of your luxury travel experience with a farewell dinner at one of our recommended Athens restaurants. You're sure to leave Athens, full of wonderful memories, having found a new and comfortable home in Greece. The above itinerary is an itinerary suggestion for your Greece vacation and the described destinations and activities represent only an example of the many alternatives from which we can help you choose.